JAMSTEC scientific team reveal the possibility of returning Positive Indian Ocean Dipole and El Nino Modoki in 2018. A La Niña condition prevailed over the tropical Pacific during the first half of 2018. It started decaying gradually from boreal spring and has almost disappeared now as tropical Pacific returns to a normal state. In the coming season, however, abnormal climate events are expected over many parts of the world owing to the development of a positive Indian Ocean Dipole and an El Niño Modoki. We have been conducting experimental seasonal predictions every month using the SINTEX-F seasonal prediction system on the Earth Simulator and providing a real-time outlook of seasonal to interannual climate variations on our website. In the latest predictions, the SINTEX-F system clearly predicts co-occurrence of a positive Indian Ocean Dipole (IOD) and an El Niño Modoki event in the coming summer of 2018. This causes a colder sea surface temperature around the eastern tropical Indian Ocean and the Maritime Continent, so that Indonesia, and Australia will be drier than normal. It may also cause crop failure and bush fire there. We observed co-occurrence of a positive Indian Ocean Dipole and an El Niño Modoki in 1994, when Japan was anomalously hot. The Indian Ocean Dipole (IOD) is a coupled ocean-atmosphere phenomenon in the Indian Ocean (Saji et al. 1999). It is normally characterized by anomalous cooling of SST in the southeastern equatorial Indian Ocean and anomalous warming of SST in the western equatorial Indian Ocean. Associated with these changes the normal convection situated over the warm pool of eastern Indian Ocean shifts to the west and brings heavy rainfall to the east Africa (e.g. Behera et al. 2005) but severe droughts/forest fires to the Indonesian region. What is the El Niño Modoki? 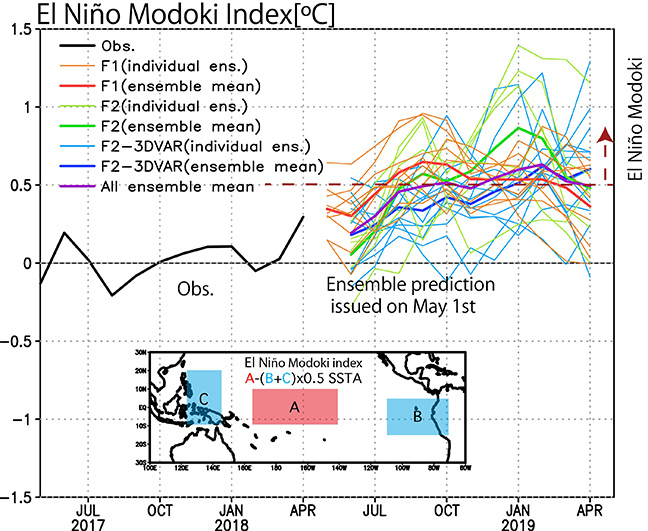 El Niño Modoki has recently been identified as a coupled ocean-atmosphere phenomenon in the tropical Pacific Ocean and has been shown to be quite different from the canonical El Niño/Southern Oscillation (ENSO) in terms of its spatial and temporal characteristics as well as its teleconnection patterns (Ashok et al. 2007). Traditionally the term “El Niño” was used for the canonical El Niño associated with warming in the eastern tropical Pacific. However, as we realize now, during El Niño Modoki the sea surface temperature (SST) anomaly in eastern Pacific is not affected, but a warm anomaly arises in the central Pacific flanked by cold anomalies on both sides of the basin. The ENSO Modoki has distinct teleconnections and affects many parts of the world. For example, the West Coast of United States of America is wetter than normal during El Niño but drier than normal during El Niño Modoki (e.g. Weng et al. 2007). Recent studies show that teleconnections associated with ENSO Modoki influence the rainfall over India and South Africa (Ratnam et al. 2011). Are the Indian Ocean Dipole and the El Niño Modoki predictable? Predictions of the IOD and ENSO Modoki are still challenging research topics. The Scale Interaction Experiment–Frontier version 1 (SINTEX-F1) prediction system developed at APL/JAMSTEC has successfully predicted several IOD and ENSO Modoki events a few seasons ahead (Luo et al. 2008; Luo et al. 2016). Based on those scientific outcomes, we have been providing the real-time forecast of IOD every month since 2005. In the process of further model developments and improvements in the predictions, an upgraded model called the SINTEX-F2 system has been developed; the new system is a high-resolution version embedded with a dynamical sea-ice model (“F2”; Doi et al. 2016). This system has successfully improved the prediction of the 2009 El Niño Modoki event. In addition, we have introduced a new three-dimensional variational ocean data assimilation (3DVAR) scheme in the model by taking three-dimensional observed ocean temperature and salinity into account. This system (“F2-3DVAR”) has successfully improved IOD prediction (Doi et al. 2017). 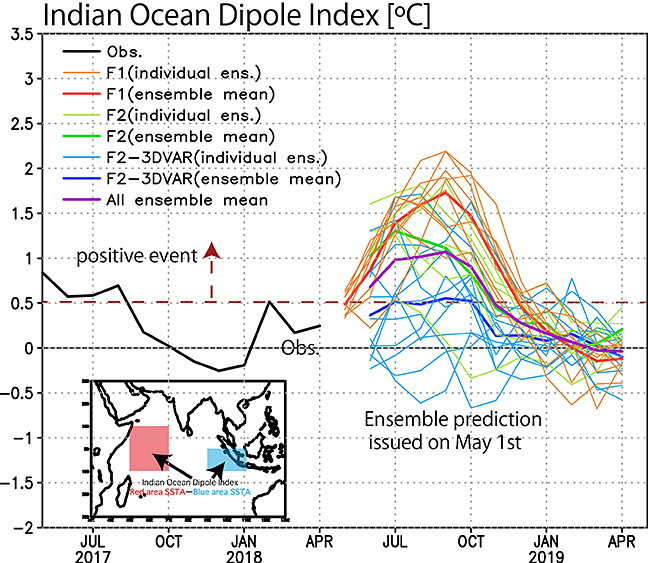 Figure 1 shows predictions of the Indian Ocean Dipole (IOD) index issued on May 1st, 2018 by all versions of the SINTEX-F system. Similarly, Figure 2 shows the predictions of El Niño Modoki index. Based on those predictions, there is a high chance a combination of a positive Indian Ocean Dipole event and an El Niño Modoki event would occur in the coming season. Figure 1. Observations (blue) and SINTEX-F ensemble mean prediction (color line) of the Indian Ocean Dipole (IOD) index, which measures the east-west temperature difference in the tropical Indian Ocean. F1″ is an original one. “F2” is a model-upgraded version (hi-resolution & sea-ice model). “F2-3DVAR” is an upgraded version of “F2” with subsurface ocean data assimilation system. “All” sums up those three systems. The prediction was initialized on May 1, 2018. The units are in degrees Celsius. Observations (blue) and SINTEX-F ensemble mean prediction (color line) of the Indian Ocean Dipole (IOD) index, which measures the east-west temperature difference in the tropical Indian Ocean. F1″ is an original one. “F2” is a model-upgraded version (hi-resolution & sea-ice model). “F2-3DVAR” is an upgraded version of “F2” with subsurface ocean data assimilation system. “All” sums up those three systems. The prediction was initialized on May 1, 2018. The units are in degrees Celsius. Same as Figure 1, but for the El Niño Modoki index. We need to pay more attention to the variations of tropical Indian Ocean and Pacific temperatures and how they are going to evolve in the coming season. The latest information by the SINTEX-F seasonal climate prediction system is available from the website, Climate Watch, and APL-Virtualearth.